More about all of this soon enough, but yesterday afternoon we were pleased to take part in a unique event. KEA has been invited to participate in a City of Coeur d’Alene committee reviewing accessibility and other issues on Tubbs Hill. Yesterday, the committee got a first hand experience with accessibility concerns on a brief field trip to the east side of the Hill — and three committee participants in wheelchairs took a first-ever trip to our City’s crown jewel. Recall that concern over impacts to Tubbs Hill caused the City Council to remove Tubbs Hill from the concept plan for McEuen Park. The Council, however, insisted that the City continue to work with stakeholders on accessibility and management issues on Tubbs Hill. This new committee has met preliminarily a couple of times and has a great deal of work to do. This was the committee’s first fact-finding outing. But yesterday, the scope of the work — and the reason for doing it — became much more clear and concrete. 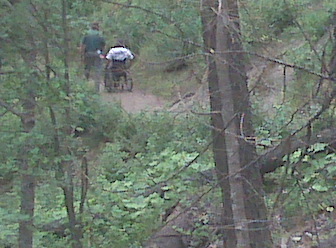 On trails most of us have no trouble navigating, wheelchairs have a great deal of difficulty. Relatively gentle uphill slopes, downhill slopes, and cross-trail slopes make travel much more difficult in a wheelchair. The small outcroppings of rocks and tree roots that most of us simply step on or step over can be impassable obstructions to a wheelchair. It’ll be a serious challenge for the committee to find opportunities for access that eliminate the natural barriers of the terrain without damaging the hill or compromising its fiercely-protected natural state. But Tubbs Hill is an extraordinary place — we saw walkers, joggers, swimmers, dogs, bratty teenagers, tourists, locals, and all manner of people enjoying the beautiful natural surroundings. 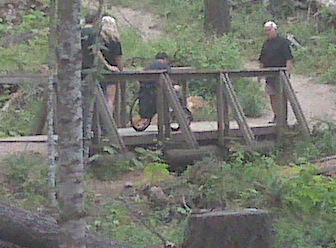 Yesterday, it included people in wheelchairs. And there was an appreciation that they belonged there as much as anyone. We must accept the fact that not every hill, every mountain, every patch of woods, every lakeshore must be accessible to wheelchairs or other seriously handicapped people. I am not handicapped except by age. My sonof 52 years has been wheelchair bound since he was 17. When he was younger and lighter and had lots of single, strong friends, he did anything he wanted in the outdoors. Hunted, fished, boated and loved it all. But he would be the first to advocate for leaving Tubbs Hill largely as is. Maybe a short wheelchair designed trail out for a few hundred yards to a nice rocky viewpoint could be considered.But don’t think that all handicapped people want to pave Tubbs Hill. Ed, Thanks for the comment. FWIW, I think the outing yesterday illustrated how difficult it will be to construct accessibility without, well, a lot of construction. Depending on how it’s done, where it’s done, and to what extent, it could change the nature of parts of the hill — something that nobody wants to happen. Well Ed it must be nice to comment for someone un able to do. 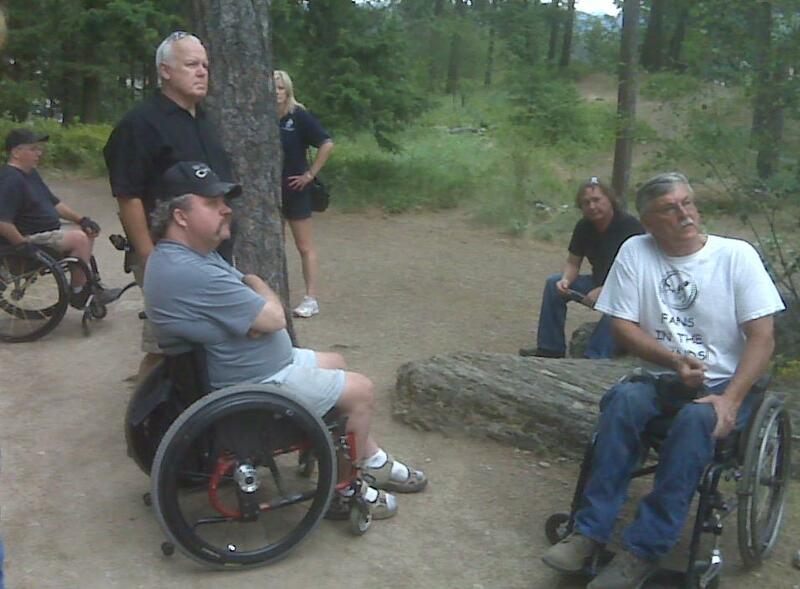 The truth is there are many people that use wheelchairs (mainly Veterans) that want to get on the hill. I am glad to see that you and Terry feel the need to keep the hill as it is. When you two wind up in a chair for the rest of your life then see how you feel. Your desire for a priority of dirt rock and roots over people show how ignorant you both are. Hoe about showing up and meeting some of the folks wishing to get on the hill face to face and tell them that they are not wanted or that it will be to big a hardship on the hill. HEY!!! How about the people. Try to put yourself in their shoes and then open up your ignorant attitudes and ideals on them. How selfish are all you people. Hey Virgil, re-read the article. I was at the tour. The people advocating to get on the hill have as much right to be there as you or anyone else. There will be less done building the trail than what has been done for people that walk upright. Try to find a place on the hill untouched by man to make it easier to walk the hill. Try to see that your rock over people stinks and I hope that someday you may need to be in a wheelchair and then you can tell me how the hill is more valuable that you. You people make me sick to my stomach. Well said Virg. Well said. But it’s typical of people to sit around and yak about things because they have theirs and screw everyone else. It’s that kind of mentality that makes you realize how selfish and self-centered people are. Who knows though, maybe Ed and Terry might be “blessed” someday by becoming a person with a disability and then maybe they might actually start caring about someone other than themselves. I somehow doubt it though. It will be wonderful to have the hill accessible as it can be while staying fairly true to its current state. I can’t wait for work to begin soon.